It’s true. Nobody has actually asked these questions yet. We made them up and then answered them with our best interest in mind… as well as yours. Naturally, you may have some real questions of your own which are completely legitimate. Ask those here. We might add some of them to this page. What happened to the original Guitar Wall? Great question. It died. But we quickly froze the idea with the thinking that we could possibly transplant the core onto another body of thought. With the miracle of modern thought medicine, we were indeed able to achieve this lofty goal. We’re hoping to prevent any organic rejection by infusing equal doses of innovation and sensibility into the mix. So far, it’s working… we think. What’s the process for getting a new wall space? Getting a wall space is not automatic. Start by filling out the form at Add a Wall Space to get the ball rolling. It’s easy and fast. If you have questions, we’re big on personal service. That’s why we have a toll-free phone number where you can actually talk to someone (a novel concept these days). After we receive your form, we quickly review it to make sure it meets our basic criteria, and you’ll receive another email with next steps. As always, we do the heavy lifting by creating and installing a wall space for you that we can all be proud of. Is there a cost for a Wall Space? If you were a wall spaceholder on The Guitar Wall from 2007 through 2016, you qualify for up to two Standard wall spaces at no cost if you fall into at least one of these six categories: Acoustic, Electric, Bass, Accessories, Effects and Amps. There is really no comparison between the old wall spaces and the new, larger and more powerful spaces on The Guitar Wall 2019. If you were not a prior spaceholder on The Guitar Wall, we’re offering you a complimentary single Standard Wall Space. There’s no cost and, as usual, we do the heavy lifting. We’ve also added a few Premium Options to the wall designed to enhance the value of your wall space. What size are the wall spaces? They are all the same size and it depends on what device you are using to view the wall. But the image we start with is 1280 x 720 pixels (16:9 aspect ratio). The wall space image you see is smaller but if you click through to an Expanded Wall Space (signified by a red GW circle), you will see the larger image (and other images as well along with additional content and outbound links). Standard Wall Spaces click directly through to their respective websites. What is the Special Opps category and how does it work? 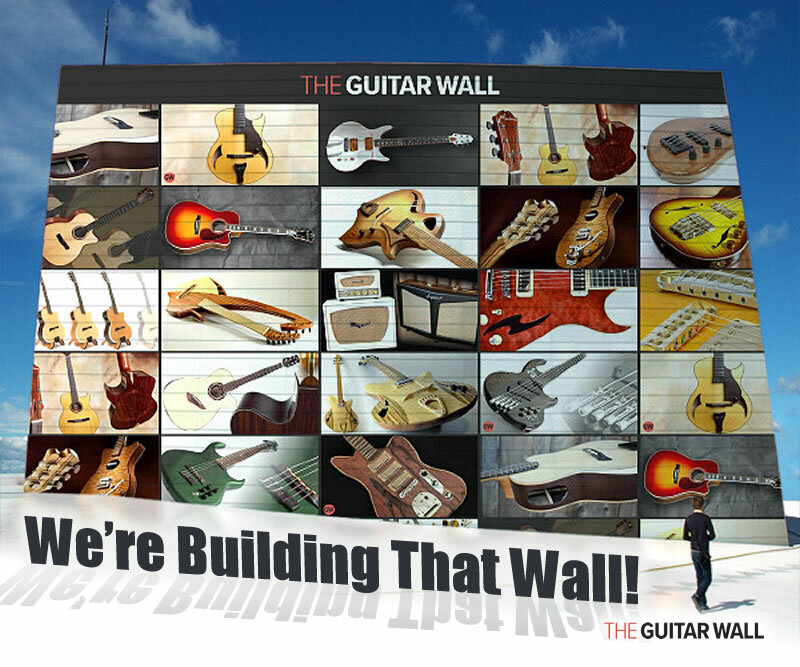 The Guitar Wall’s Special Opportunities category offers a variety of unique options, discounts and other promotional incentives available only by clicking a wall space in the Special Opps category. This is a Premium Option and is well-promoted by The Guitar Wall and our existing network. What’s the difference between Standard and Expanded Wall Spaces? Quite a bit actually. Our Standard Wall Space is similar to the original wall spaces in that mousing over or touching the space (depending on device) identifies it. Clicking or touching again sends you to the designated web location for that space. Our Expanded Wall Space is something new and entirely different – but still simple and effective. Instead of clicking out to a website, the space leads to a landing page that displays the full-size wall image as well as up to 4 additional gallery images that display as a slideshow. The page also includes textual information, outbound links and social media sharing – all in a hyper-clean layout designed to close the deal. This is a Premium Option. How do you drive traffic to the Wall? Since we’ve been in the market for nearly 12 years, we have a lot of established channels already set up to reach out and promote The Guitar Wall 2019. And with the marketing and PR power of GuitarPR, we have the means to get the word out around the world. That’s what we do. Again, we’d like to emphasize that this is not complicated. It never was. It’s a very simple value proposition that requires little or no capital outlay. So ROI is pretty easy to achieve. Can we submit our own image for our wall space? Yes. Maybe. Or no. Actually, it depends. If we approve it, then yes. If we don’t approve your image for any reason, we’ll create one for you (and to your liking) at no charge. That’s always been the deal and it still is. We’re not trying to be funny here, but the whole point of The Guitar Wall is to create a visual discovery experience. You may already know how to do that, but if you don’t, that’s OK! We’ll help out! Simple as that. Can we have more than one wall space? The short answer is yes, under certain circumstances. There is no long answer. Sorry. But, you can get more information about our Premium Options. How else could The Guitar Wall be used?